Extra Extra Wide Width Fit Diabetic Snuggler slippers for swollen feet with adjustable closures cushion and separate swollen ankles and swollen feet while promoting circulation. Makes a terrific diabetic slipper and edema slipper. Wonderful for fragile skin and delicate skin. A great for choice for elderly with bunions, corns, hammer toes, foot edema and podiatry foot problems. 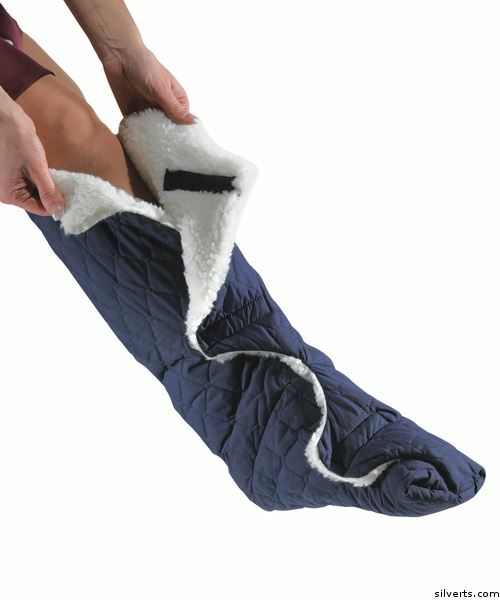 This quilted boot slipper by Silvert features polyester-cotton with warm plush lining. Hook and loop fastener open to toes. Not for ambulating (not for walking). Terrific for disabled or wheelchair dependent elderly. A wonderful solution for those with arthritis! Great slippers for nursing home patient residents who are wheelchair users. This loose boot style slipper makes a terrific post-op post surgery slipper. Machine washable.